Every industry professional needs to stay on top of industry trends and evolving best practices, and that’s no different for Canadian automotive dealers. Staying abreast of the changing way people make purchases, technological innovations, and how your peers are marketing and selling vehicles may mean the difference between prosperity and obscurity. If you’re interested in learning more about the latest marketing techniques that are affecting the car dealership industry, you should check out these upcoming events and attend as many as you can. Keep an eye on our events page for future industry events, and keep your dealership on the cusp of the new digital marketing world. Here are five automotive dealer events you don’t want to miss out on. The Calgary International Auto and Truck Show is one of the largest new vehicle exhibitions in all of Western Canada. Featuring events like the Vehicles and Violins Gala and the mobile men’s health clinic “Man Van,” this show is a great place to see the new models rolling out the world over. The National Automobile Dealers Association (NADA) Show Expo is the automotive industry’s premier marketplace to find a host of products, services, and technologies. The event is targeted specifically to franchised new car dealerships. It boasts 700,000 square feet of exhibits that highlight 500+ manufacturers and suppliers of the latest and coolest products to help keep your dealership hip. It also offers a comprehensive education program across more than 120 sessions and gives you a chance to hear industry experts talk on a variety of subjects. The 2018 Women & Automotive Canadian Leadership Forum is a one-day event that connects revolutionary leaders, change-makers, and risk-takers in order to share and discuss ways to advance women into leadership positions across the automotive industry. The forum offers education, networking, mentoring, and career opportunities to women entering the automotive industry, so they can be ready to assume leadership roles. Take part in their short survey to help guide the content available during the forum. a stunning level of expertise through keynotes offered by leaders in the industry. Brought to you by the Trillium Auto Dealers Association (TADA) and Consolidated Dealers, this conference was specifically created for dealers. The TADA’s March session auto dealers innovation series was combined with Ontario Dealer Day to provide a destination event with the very best speakers and vendors. Take your dealership to the next level by networking, learning, and experiencing what this convention has to offer. And if you’re a dealer looking for some funding support, check out the ACE Dealer Ticket Passport program (offering $200 off your ticket for visiting 15 exhibitors and attending the final keynote)! 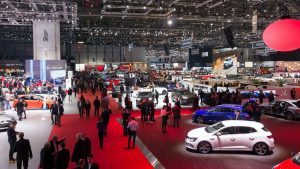 By attending as many of these events as you can, you’ll be ensuring your dealership is able to evolve with the best new practices and tactics when it comes to marketing and selling vehicles in 2018.